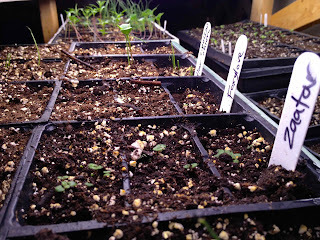 Ah it's spring.. and the space below my grow-lights is quickly filling up. Well, truth be told, it's already filled up and I have so much more I want to plant! The gardeners lament, eh? Book and magazine deadlines as well as work travel delayed my seeding (and blogging - sorry! 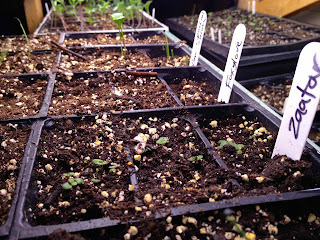 ), but I'm happy to say that I've caught up and I have flats of tomatoes, peppers, onions (my latest obsession) and assorted other seedlings happily growing in my basement. In fact, Margot Brunelle from CBC radio was here this morning poking around my seed lights and chatting about the pro's and con's of growing your own plants from seed. Tune in on Thurs and Friday of this week to CBC's Information Morning for my two segments! 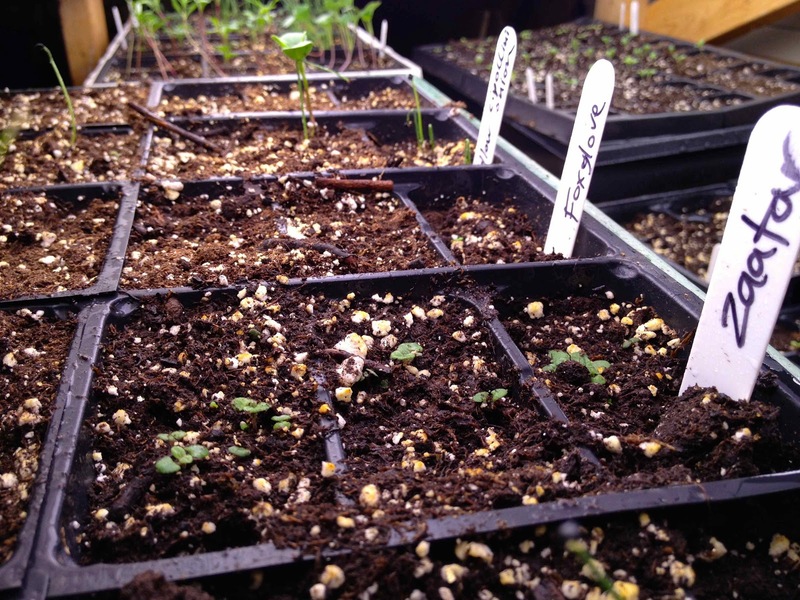 I've got a lot of variety beneath my seed racks - about 2 dozen tomato varieties, 6 heirloom onion varieties, 6 cucumbers, 4 gourds, some herbs and flowers, and even quinoa! 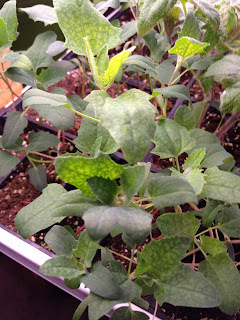 I bought my Cherry Vanilla quinoa seed from Baker Creek in the US, but they don't have a photo of the plants on their website, so I found this one if you're curious. I don't expect to actually get a huge quinoa harvest (or even a modest one) from my 2 dozen plants, but I am excited about how ornamental they are. Spectacular spires of cream and pink flowers.. Can't wait! 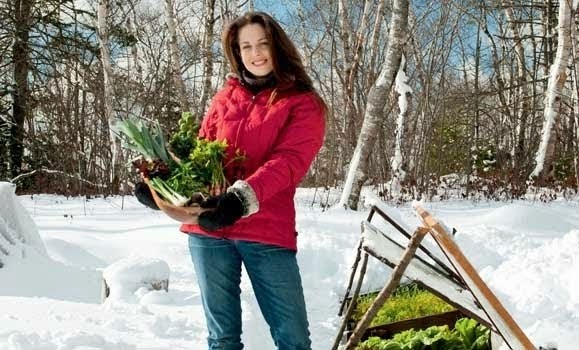 If you're in Halifax, join me tomorrow night at 7 pm at the Keshen Goodman Library in Clayton Park for my free talk on growing veggies and herbs in pots/pallets/and more! Plenty of easy ways to grow some of your own edible plants this year. 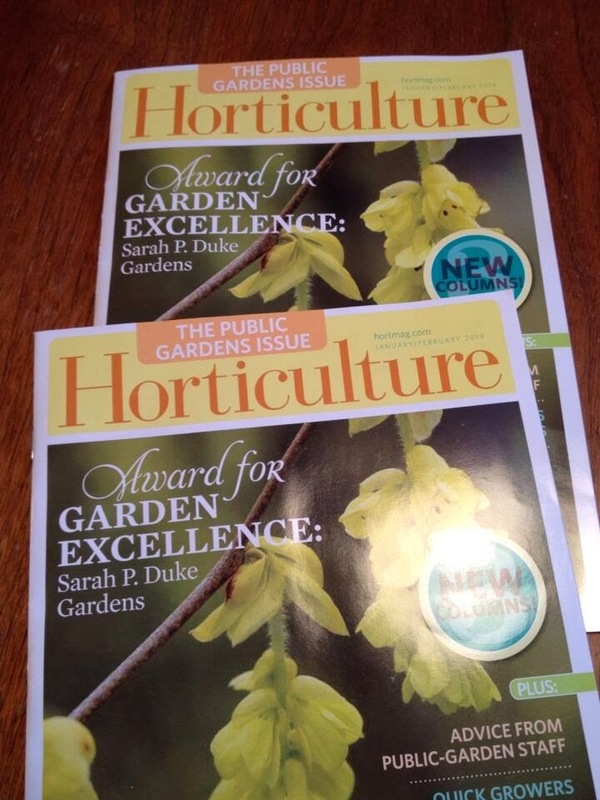 And, this Thursday at 3 pm ET (or 4 pm Atlantic time), you can join me for a fun and visual webinar at Horticulture Magazine on growing food year round. Space is limited to 1000 and you can sign up here! 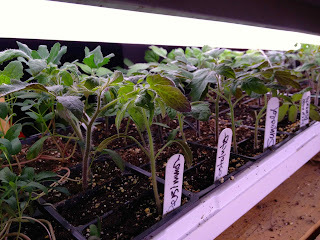 Here's a sampling of what's under the lights..
at first (my fault), but have thickened up nicely. Can't wait to follow the progress of the quinoa. spice mix. See the tiny plants.. Potential! 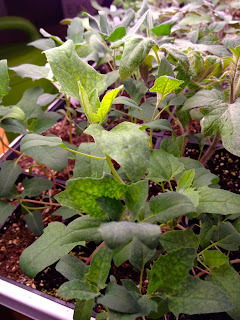 Giant Kossak Kohlrabi from Halifax Seed. in early July for an autumn/winter crop. Zinnias! C'mon, who doesn't love old fashioned annuals. butterflies on a daily basis and they loved our zinnias. That is lovely. 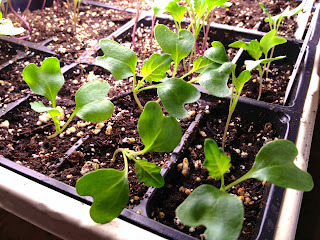 I always try to do some experimenting with growing things. Growing your own Quinoa sounds great. Your tomatoes look so big already! Mine are just wee things yet. Onions are huge though and I'm wondering how soon I can put them outdoors. When do yours go out? The onions are usually in the garden by now.. i'm a bit late! :) You can put them out anytime and cover them with a row cover if the temp dips below 5 or 6 C. They don't mind the cool weather. You can also give them a haircut by trimming them with scissors, keeping them about 5 or so inches tall. this will also thicken them up. and eat the trimmings - scrambled eggs, etc. Yum!! ooh I love seeing what other gardeners have growing already! everything looks great! I am especially intrigued by the Zaatar, I've never heard of it. we grew quinoa with great success a couple of years ago, beautiful plants! 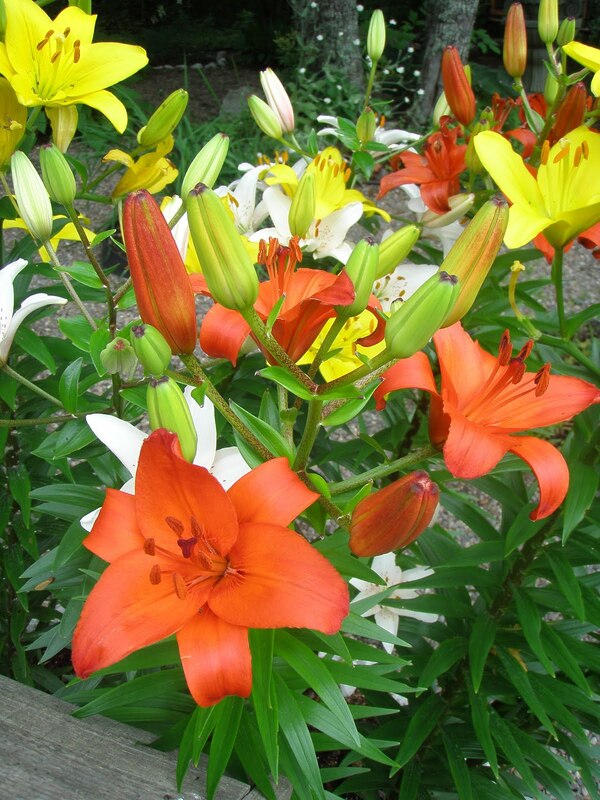 we grew Organic Brightest Brilliant and it was a gorgeous rainbow of colours. 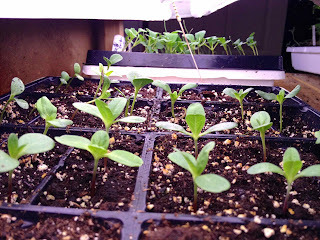 I was super pregnant at the time and didn't ended up going through the process of cleaning the grain to remove the saponin...but super worth growing, I am going to try it again this year. Ours ended up about 6 feet tall and they were in poor soil too. thank you SO MUCH for your amazing book, it's been my garden bible for the past couple of months and I've learned a ton. This will be our first year trying out the year round growing! I live and garden in Yellowknife, Northwest Territories. 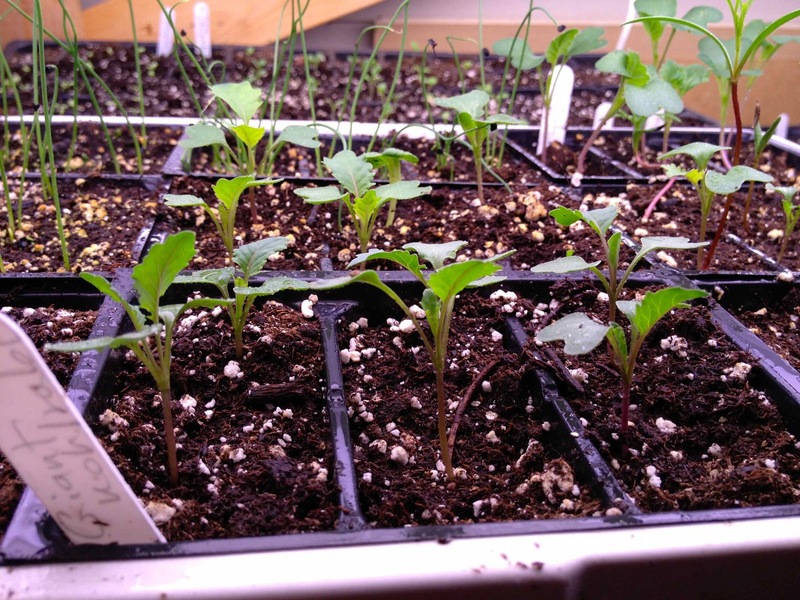 I tried growing quinoa in containers, and that was my most successful year. I had 5 in a big whisky barrel, got about 3/4 of a cup of quinoa out of them. 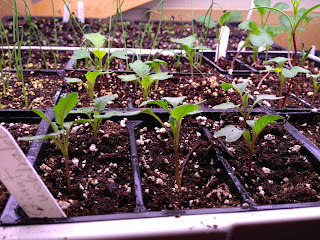 I then planted in the garden and was not so lucky, especially with the pink and purple quinoa. It may take longer to reach full maturity. Will try again this year year in the garden but not with the pink and purple one. I tried to find an email for you but I can't see one on your page lovely - was just looking to talk to you about blog design. If you want, pay me a visit http://www.gastronomicalsovereignty.com. My email and contact info is there. Not that there's anything wrong with your blog - but it should match the fabulousness of the content :) xo! Oh wow, Halifax Seed has the big kohlrabi now! I must have missed it last time I visited (although that was at least a month and a bit ago). Thanks for sharing that! This is indeed a great garden! I love this. Grow lights really helps so much especially with an indoor garden like this. 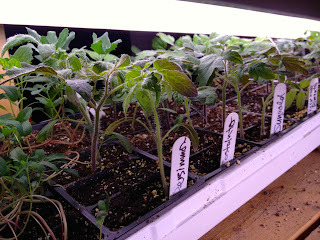 Grow lights are very much essential if one decides to cultivate plants which sunlight is not possible. I find this so amazing. This garden seems to be so healthy. Thanks for sharing! What kind of grow lights do you use? I need something to help my efforts! Oh! I love the idea of growing plants indoor. 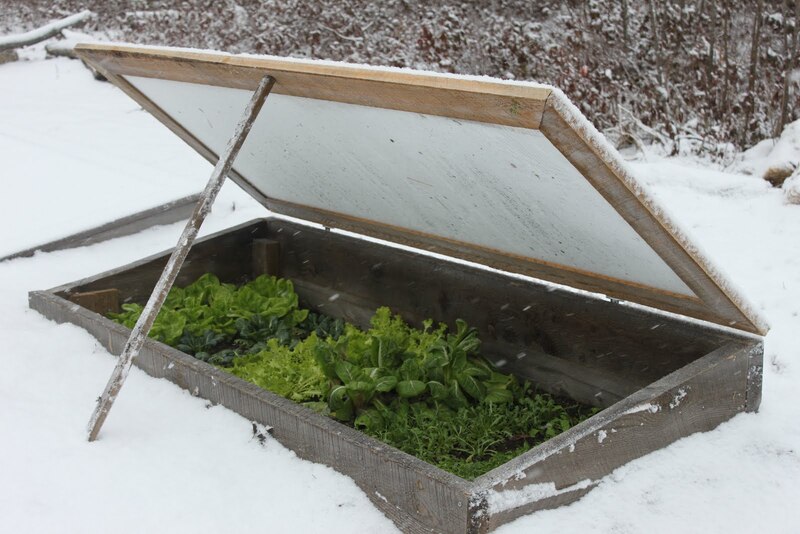 It seems a great way to protect the plants from harmful weather and insects. And yours really look great. Your plants look healthy and well taken care of.